As part of INSIDE Secure’s award-winning silicon Intellectual Property (IP) product portfolio, the EIP-76 TRNG is an advanced hardware based, technology independent True Random Number Generator. Security is now a basic requirement for all devices. To support that requirement, semiconductor designers must build strong cryptographic capabilities into their chips, capabilities that begin with a True Random Number Generator (TRNG). A TRNG is used for the generation of keys, initialization vectors, cookies, and nonces; it is an essential building block for all robust security solutions. Also, configurations are available to address safety standards for automotive applications. 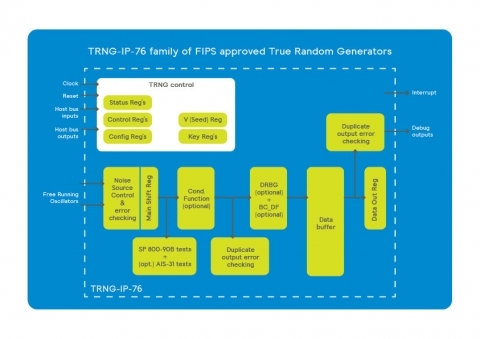 The TRNG-IP-76 True Random Number Generator provides semiconductor designers with an all-digital silicon-proven solution that has been thoroughly field tested and deployed in dozens of devices developed by the industry’s leading semiconductor companies. Patented test circuits on the oscillators to detect lockingto periodic signals. Repeating output data detection on NRBG and DRBG (compliant with [FIPS 140-2]). Hardware implemented ‘Repetition Count’ and ‘Adaptive Proportion’ tests on the Noise Source (compliant with [SP 800-90B]). Continuous tests on the Noise Source (compliant with [AIS-31]): ‘monobit test’, ‘poker test’, ‘runs test’, ‘longruns test’ and ‘Noise Source failure’. Secure random data buffer wipe-after-read and zeroize functions (compliant with [FIPS 140-2]). Secure reading mode where data is only available on request, for a (configurable) limited time. Automatic shutdown on fatal errors. Automatic de-tuning of FROs after lock detection. Various on-line and off-line integrity and known answer tests on the Conditioning Function, DRBG andself-test circuits. Configurations available with countermeasures against Fault Injection Attacks. True Random Number Generator (TRNG) Digital Post Processing compliant with the FIPS 140-2 and AIS 31 standards.